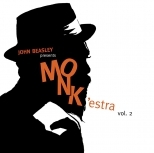 One of last year’s finest releases was John Beasley’s Big Band album Monk’estra, Volume One. A master arranger, Beasley put together a who’s who of musicians to turn the Thelonius Monk library of tunes into something more innovative and thought provoking than they had been in years. A pair of Grammy nominations followed, so it was hoped that an encore set would soon appear. Monk’estra, Volume Two is here, and it was well worth the wait. Digging deeper into the Monk catalogue, and allowing members of the band and select special guests to stretch out a but have made this is a delight. Whether it’s Dontae Winslow turning “Brake’s Sake” into a whirlwind with his trumpet solo and rap interlude; a sultry “Dear Ruby” artfully sung by Dianne Reeves; or the innovative medley of “Ugly Beauty” and “Pannonica”, this is an album that rewards a careful listener at every turn. 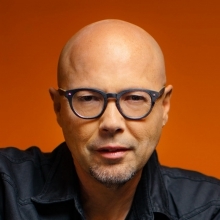 We’ve come to expect this sort of top notch work from John Beasley, who has earned acclaim for his work as Music Director for The Thelonious Monk Institute gala concerts. Every April 30th, he produces and directs the International Jazz Day concert in a global city bringing together all-star jazz artists to perform. The White House concert "Jazz at the White House" earned Beasley an Emmy nomination for Best Musical Direction. Beyond his direction and arranging, he writes and records television and movie scores, and finds time to work in small ensembles as well. He has been part of touring bands for Miles Davis, Freddie Hubbard, and Sergio Mendes, as well as rock bands like Steely Dan. He never ceases to amaze. Podcast 590 is my conversation with John about the Monk’estra, which I had the pleasure of seeing live at the venerable Ronnie Scott’s Jazz Club in London earlier this summer. Musical selections from the new CD include “Brake’s Sake”, “Ugly Beauty/Pannonica” and “Evidence”.